IN an unexpected announcement during the start of a full meeting of Down District Council, the chamber was stunned as Down District Council Chairman Councillor Mickey Coogan made an announcement that he has resigned from his party, Sinn Féin. 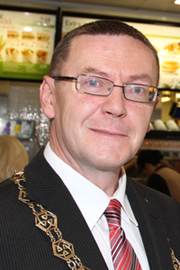 Down District Council Chairperson Councillor Mickey Coogan has resigned from his party. The Sinn Féin Chairperson of South Down Ryan Morgan has said following the meeting that he was sad and disappointed that Ballynahinch Councillor Mickey Coogan had tendered his resignation from the party. Mr. Morgan said: “Mickey Coogan has served Sinn Féin since 2005 on Council so I am disappointed he has decided to resign from the party. Councillor Burns declined to press the matter and the Council business moved on.